The KV series had performed well, despite some limitations in the early part of War World 2. However when the more capable German Tiger tank appeared with its lethal 88mm main gun as well as the Panther with its high velocity 76mm and both being heavily armoured during the middle of the war, Russia needed a new more heavily armoured tank and a medium tank with a larger main gun. So the T-34 was fitted with a new 85mm main gun and development of the new heavy tank begin. A stop gap whilst development began was the KV-85. The new tank, which was designated the IS-2 entered production in 1943 and was used as a spearhead in the Battle of Berlin by the Red Army in the final stages of the war. The 122mm A19 main gun was an established field gun as a towed howitzer and not only offering a capable armour piercing capacity at short ranges, it offered a superior bunker bashing capability thanks to the High Explosive rounds it fired. The 122m A19 had been around since the 1930’s and had an established manufacturing infrastructure behind it, which also supported the decision to adopt it as the main gun. AKA the D25-T, it used a two part ammunition. The HE round or Armour piercing round was loaded in to the breach and then the combustible charge was loaded after, at which point the breach was closed and the gun fired. Two 9.62mm and one 12.7mm MG’s were used as secondary armaments. The KV series had an all-round respectful level of protection, but the IS series had a better layout enabling it to offer a greater level of frontal protection against the German Tiger and Panther tanks main guns. Built of an all steel construction its frontal armour was equivalent to 160mm thickness and the turret layout meant it had a lower profile than those of German tanks making it a harder target to hit. Early tanks lacked gun tube travel locks or antiaircraft machine guns, and had narrow mantlet’s. 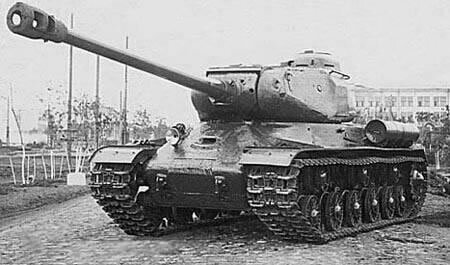 Later improved IS-2s (model 1944) had a faster-loading version of the gun, the D25-T with a double-baffle muzzle brake and better fire-control. It also featured a simpler hull front without a ‘step’ in it (using a flat, sloping glacis armour plate). Some sources called it IS-2m, but it is distinct from the official Soviet designation IS-2M for a 1950s modernization. Other minor upgrades included the addition of a travel lock on the hull rear, wider mantlet, and, on very late models, an antiaircraft machine gun. In the mid-1950s the remaining IS-2 tanks (mostly model 1944 variants) were upgraded to keep them battle-worthy, producing the IS-2M, which introduced fittings such as external fuel tanks on the rear hull (the basic IS-2 had these only on the hull sides), stowage bins on both sides of the hull, and protective skirting along the top edges of the tracks. By the 1950s the emergence of the main battle tank concept—combining medium-tank mobility with the firepower and later armour of the heavy tank—had rendered heavy tanks obsolete in Soviet operational doctrine. 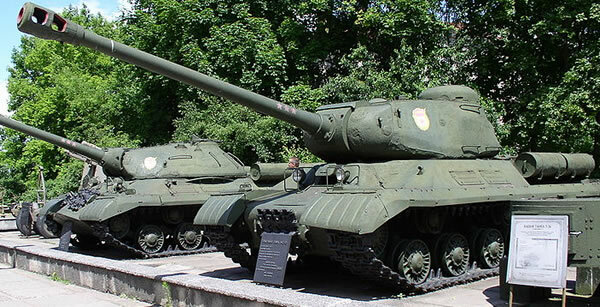 In the late 1960s the remaining Soviet heavy tanks were transferred to Red Army reserve service and storage. The IS-2 Model 1944 remained in active service much longer in the armies of Cuba, China and North Korea.